Our team at Watkins and Sons Paving is able to provide you with preventative maintenance services for your parking lot that will maintain and even improve the curb appeal of your business. Parking lot maintenance is also a financially sound way to ensure that you are able to get the longest working life out of your asphalt pavement. Not only do we patch and repair potholes, but we also fill cracks in asphalt. Taking action as soon as you see any cracks in your asphalt helps to prevent your parking lot from deteriorating. Filling or sealing the cracks properly prevents water from seeping into the asphalt to compromise the base. It minimizes the growth of cracks and helps to protect the areas next to the cracks. A protective layer on your parking lot protects it from the damage that can be caused by constant exposure to ultraviolet rays. It also prohibits water and oil from seeping in the asphalt and causing potholes. The addition of bollards in your parking lot is a great way to increase safety and security. We can install a variety of bollards, including bollard sleeves and poles. We also install rubber, plastic and concrete car stops. If you are in need of signage for your parking lot, we can install signs for traffic control or restricted parking. 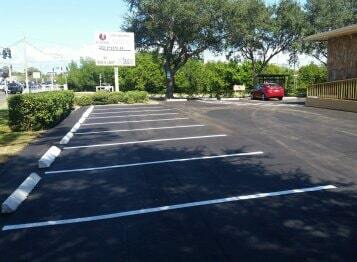 Maintaining the appearance and effectiveness of your parking lot is important. Contact us at Watkins and Sons Paving to see how we can help you.